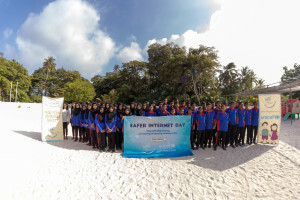 Advocating the Rights of Children (ARC) marks Safer Internet Day 2019, with special activities in H.Dh Nolhivaranfaru, in partnership with UNICEF. The two day activities held from 4-5 February, included awareness sessions from ARC’s Surf Smart Campaign promoting online safety, which were held for all students of Grades 6 – 7, as well as discussions with all students from Grades 8-10, on using the internet safely, respectfully and responsibly. ARC also believes that it is vital for parents, teachers and the community to work together in raising awareness about the importance of online safety, in line with this year’s theme ‘Together for a better Internet’. In this regard, ARC held discussions with youth as well as parents, on ways to help keep children safe, while they learn, share, connect and gain visibility online. ARC plans to work closely with relevant stakeholders to promote internet safety for children, and is currently making preparations to conduct a nationwide survey to gain a better understanding on risks and safety for children on the internet. ARC expresses sincere appreciation to HDh. Nolhivaranfaru School, for facilitating the activities and encouraging community participation to promote safe internet use for children. Safer Internet Day is marked annually, to inspire positive change and raise awareness on safe internet use.